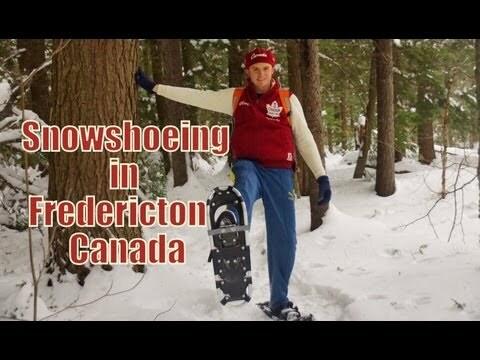 This is a travel video of us snowshoeing in Fredericton, New Brunswick, Canada on a nice winter day through O’dell Park in the heart of city. Previously, I had only ever been to O’Dell park in the summer when visibility was good and animals were easily spotted. In this situation, a thick blanket of snow covered the entire forest/park with not a single human or animal in sight. During the cold winter months in Canada one has a choice of either embracing it or staying at home like sissy. Although I’ve escaped to SE Asia to escape the brutal winters in Canada in the past something was different this year. I actually was really craving the opportunity to enjoy some winter sports such as public skating, playing ice hockey and going snowshoeing. We decided to head out and break our own trail along the gorgeous paths of O’dell Park. Luckily, my father and close family friend had an extra pair of snowshoes for me to borrow for the day. For those who have never tried this before, it’s as though you’re wearing mini-skis or enormous boots. While walking you lift your legs up before you thrust them forward. It’s almost as though you’re relearning how to walk on the spot. It proved for an interesting challenge. Along the way we spotted several sets of animal tracks laid in the snow; however, we didn’t actually spot much wildlife during our trailing. You’ll notice in the video the significant accumulation of snow along with some gorgeous scenery along the way.